I studied 3D for games in DKIT last from September until June, the course focused on getting students ready for the workplace. The focal point of the course was the work placement module which takes place each May. I applied for a work placement/animation internship in GLUE in April and was pleased to receive a quick response from Ray Mongey, the Managing Director. He invited me for a chat in their office located (at the time) in Mill Street, South Dublin. I arrived just after lunchtime on Friday and was greeted warmly by the team and shown around the office which was small, but well furnished and cosy. We sat on the couches in the lunch area and through a large window I had a great view of Dublin. Ray explained that the main project I would be working on was a video celebrating the 60th anniversary of Eurovision. We would be creating a short video containing some of Eurovision’s most iconic performers depicted as LEGO minifigures. I am a huge fan LEGO and in particular I love the LEGO movie, so I was very thrilled to be getting this opportunity to work on a fantastic project and progress my skills. Ray asked if I could start the animation internship following Monday and although it was mid semester, I was given permission from our Programme Conveyor, Michael Connolly, to start immediately. Ben working on the LEGO project in GLUE’s previous office on Mill Street. I arrived bright and early on Monday morning, itching to get stuck in. The team began filling me in on the progress they had made and on the organisational systems in place. A lot of prep work had been done before I arrived; the team had strong animatics and storyboards completed and I got an excellent idea of what the finished video would look like on that first morning. The production pipeline was excellent, as was the organisation and distribution of work, which meant that every team member could work on a different aspect of the project simultaneously. 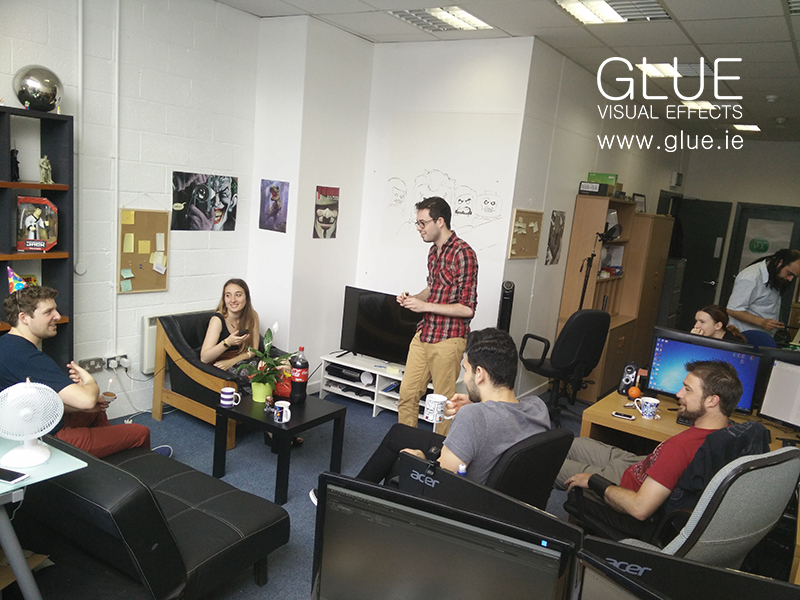 From the earliest moments, the team made me feel welcome and it was the people who work in GLUE above all else that contributed to my enjoyment of my work placement. The team laid out the process to me; I would be given a 3ds Max file containing a character and some placeholder objects. The base structure of all LEGO minifigures are the same, so each character consisted of the same pieces. The difference between the characters becomes clear through texturing and accessories. While I was animating, other team members worked on modelling the hair, microphones, guitars and any other props needed, as well as the background elements – at the same time the texturing, materials and lighting were also worked on. After I’d been briefed, I began animating the character in 3ds Max. I started with one character and concentrated on having him dance; this was to get a feel for the character and see what ways it could be moved and manipulated. 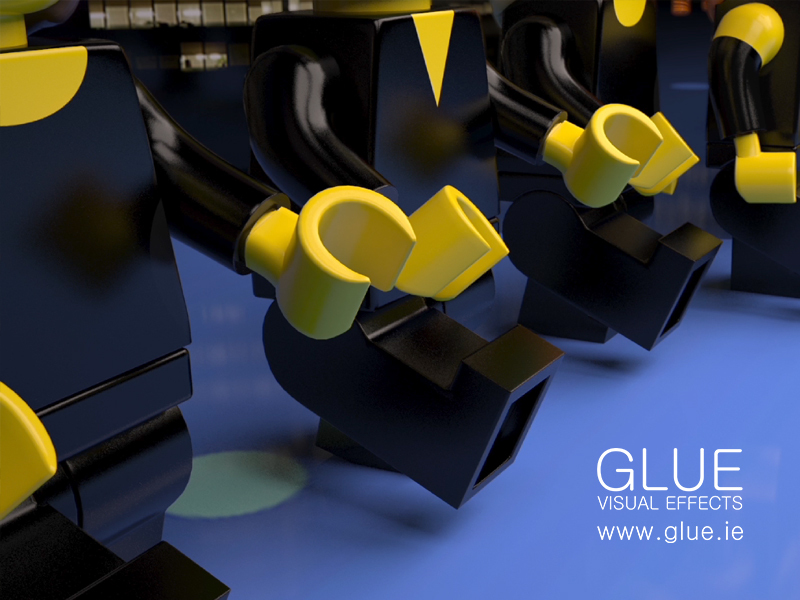 We wanted to simulate the style of stop-motion animation from the LEGO Movie and generate a brickfilm aesthetic through animation. We talked about some different ways of achieving this and decided it would be best to use stepped frames, which involves posing the character and when the animation is played back it transfers from pose to pose instantly, with no interpolation. The result is a jumpy, stop-motion style movement. If you would like to read more about how we created the LEGO Eurovision animation why not read our blog post TOP 5 BEST LEGO EUROVISION MOMENTS! I had very strong reference to help define the style and the content of the animation. The magic of the internet meant that I had access to all of the Eurovision acts and could spend all the time I needed to get the routines correct. I have a copy of the LEGO movie at home and I watched that often in the first week to immerse myself in the style of movement and humour captured in the film. We created different 3ds Max files for each of the Eurovision acts. There were predetermined time limits for each scene and shot. I began by shortening my timeline to reflect the total length of the scene. Then using the storyboards, I would block out the animation. working from general to specific. I placed the character in the area they would be standing at the start and end of the scene, then I would fill in their position halfway between these times and repeat that process. Every so often, I would render a preview video and check the timing of the scene. When I was happy with the overall timing I would move in and begin animating characters dancing for each shot. Over the next few weeks (and due to hard work, dedication and many cups of tea! ), we made significant progress. As the project advanced, we would render some stills of the characters to see how the materials and textures were developing and when viewed alongside the preview animations we got a sense of how the project was progressing. When I had finished up the character animation I moved on to lip-syncing in After Effects. I had done some lip syncing in the past but never in After Effects, Ray showed me the setup he had created for the lip sync and some AE basics, I was happy with how quickly I picked it up and delighted with the results. The final video was released on LEGO’s YouTube channel the night before the Eurovision final and we were very pleased with the result. 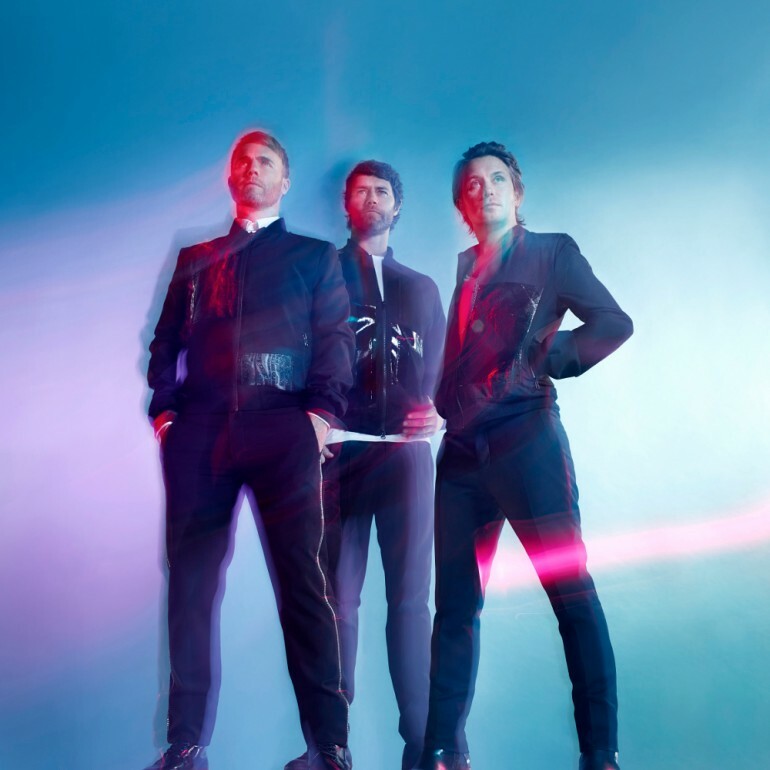 At this time, GLUE began work on a poster for Take That’s Manchester Arena show. This was an enjoyable project. 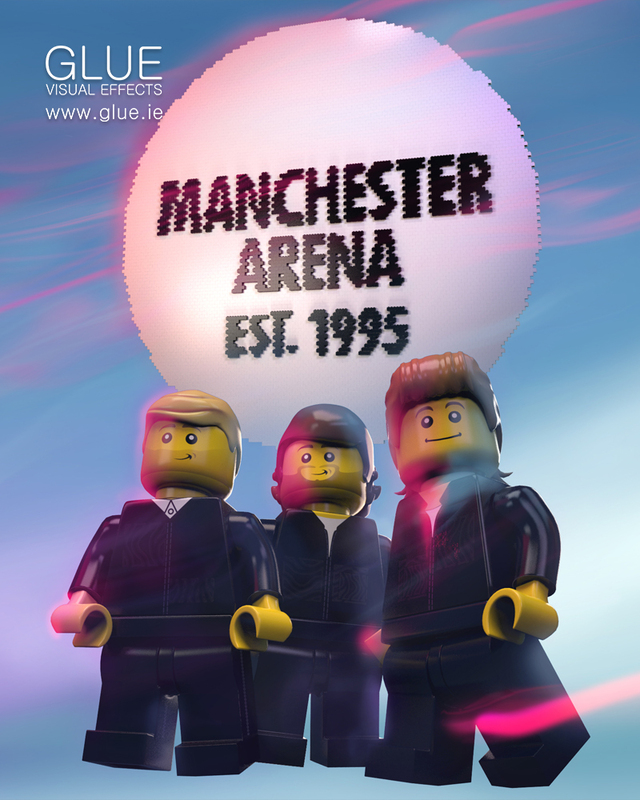 We were recreating one of Take That’s iconic posters in LEGO form. A similar pipeline was used on this, but this time instead of animation I was trying to recreate the pose from the original poster. While working on the poster, we were joined by a new member of the team – Craig. 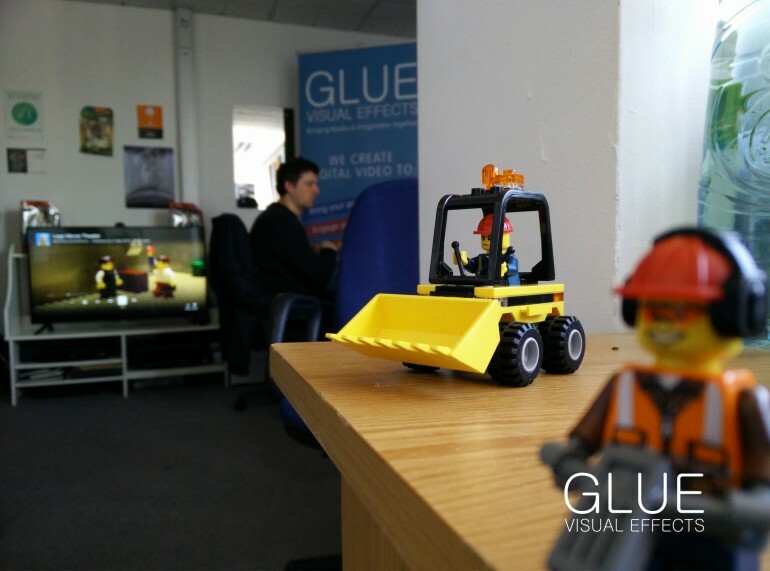 GLUE was getting too big for Mill Street and at the end of May we moved office. GLUE relocated to the Docklands Innovation Park in East Wall (very handy for my bus route, but I suspect that had little to do with the choice of destination!?). The new office is much larger, which is great because shortly after arriving we were joined by another animator – Estelle. Ben and Dom working on the Coolest Projects awards in the new office. Estelle and I began work on animation for Coder Dojo’s Coolest Projects awards. This was really exciting as our work would be on show on 4 huge screens at the RDS. It was a very short deadline and the whole team really pulled together to create some nice short animations. We were to use established characters, but our modelling team would have to create 3D models of those characters based off the 2D character design. When the characters were rigged and skinned we could begin animation. The project involved creating eight vignettes, involving two characters who would introduce a video to the audience while performing martial arts. We got to do some fun research on martial arts films and cartoons from our childhoods. A nice touch from the people at the Coolest Projects was that we got to go to the event and see our work on the big screens, Ray was even invited along to judge at the event. The awards were open to all coders aged between 7 and 17 years with projects in a number of different categories, including Scratch, Websites, Web and Platform Video Games, Mobile apps, Hardware and Evolution. Some of the work on show was astounding and even included a very cool LEGO set with flashing lights and sirens! 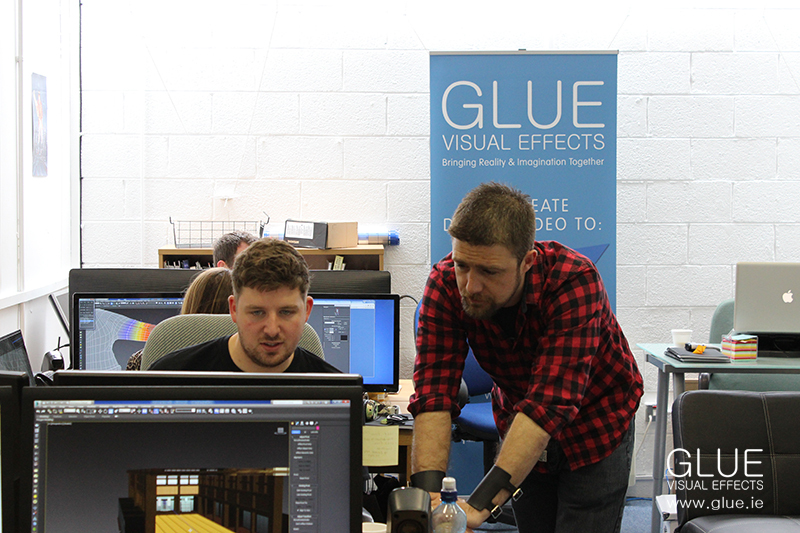 My animation internship with GLUE was a great opportunity and I am delighted with how I have progressed during it. I have to thank the team at GLUE for this, they welcomed me in and were always happy to answer any questions, point me in the right direction and showed great faith in me. In the time I’ve been herewith the team, the office and the resources at GLUE have expanded, and I’m sure GLUE will continue to grow in the future. I also want to thank the Creative Media programme in DKIT were it not for the excellent lecturers, in particular Michael Connolly, I would not have had this great opportunity.